Click here to check out my video on YouTube! Miss Papillon is one of approximately 100 dogs recently rescued by authorities in Canada. These sled dogs were underweight and lacking proper care and shelters and rescues worked together to bring the dogs into safety. Papillon ~ or known here at MaPaw as Papio ~ is a petite, one year old girl who is surprisingly socialized. She came into rescue a bit skittish and uncertain, but quickly gained confidence as she made friends. She loves to play with other dogs and is thriving on human affection and companionship. Papillon is doing very well with housebreaking and is quickly adapting to being an inside pet and part of the family. She is on the small side, but her true nature shows through and she is quite a puller on a leash. She will need a home where she can continue to learn to be a pampered pet. 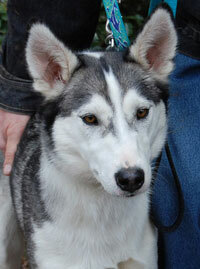 She will also be best in a home with another active dog to play with and a sturdy “sibe-proof” six-foot fence. The future is bright for this little girl and we are looking forward to watching it all come true for her.